This beautiful hardtop is one of the last of the famous Chrysler 300 “Letter Series” high performance luxury cars. For ten years, from 1955 to 1965, these were the muscle cars of their day. Built in very limited numbers by the Chrysler Corporation, each year’s model used a new letter as the model 300 Suffix. 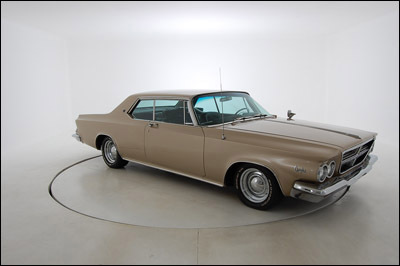 This 1964 Chrysler 300K is vehicle Identification number 8443176919. Before the days of the Daytona 500 Speedway, Chrysler 300 “Letter Series” cars raced on the sands at Daytona Beach and swept away the competition. In the Nascar flying mile. The 300s were driven by such famous race drivers as Carl Keikafier, Tim Flock and Lee Petty. Chrysler 300s remain among the most memorable performance cars ever built. With limited production, the 1964 Chrysler 300K was often referred to as “The Beautiful Brute,” Its big 413 cubic inch, 360 horsepower wedge engine had a throaty growl and appealed to that rare kind of driver who insisted on a no-compromise kind of automobile. This is one of the few Chrysler 300 “Letter Series Cars” still in existence today.